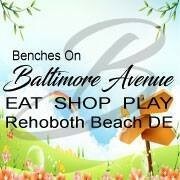 Businesses on Baltimore Avenue - Please join the fun, be creative, create photo opps for selfies & family photos! Attract foot traffic and shoppers to your business & Baltimore Ave. and 1st Street. Please only use zip ties & floral wire to affix decorations to benches.